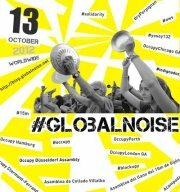 The Direct Action Collective is hosting an afterparty at MAC after the day of Global Noise, which is a celebration of the anniversary of the Global Occupy and European Indignado movements. The Melbourne event is being co-ordinated by Real Democracy Australia and the day of protest will adopt the 'casserolada' technique of banging pots & pans. The Direct Action Collective will meet @ the 8 Hour Monument from 11am and march to City Square, so join us with your black flags, black & red flags and pots & pans.